Brisbane, the capital of Australia’s Queensland state, is a large and modern city with more than 1.6 million residents. Originally founded as a penal colony in the early 1800’s, Brisbane’s layout still reflects the old laws regarding access to the penal area; when the colony was founded, free settlers were not allowed near the prisoners, meaning that even today, much of Brisbane is spread out around the central city. Brisbane’s location within Queensland makes it an ideal jumping off point for excursions around the area, including trips to the Gold Coast, the Hinterlands and the Sunshine Coast. As a result, the city offers a wide variety of accommodations, from budget-friendly hostels to full service five-star resorts. So how do you find the best hotel deals available? Try some of these tricks for your Brisbane vacation. Travel at the right time: Summer is high season in Brisbane, with warm temperatures and plenty of sunshine. (For those in the northern hemisphere, remember that summer is November through March in Australia.) Low season is the rest of the year and thanks to Brisbane’s subtropical location, the weather is still pleasant and the hotel rates are lower. 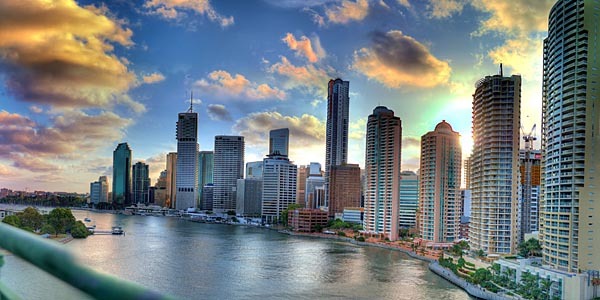 Explore different neighborhoods: While Brisbane is one of the largest cities in the world in terms of land area, the actual city is quite compact, with several distinct areas. When choosing a room, pay close attention to the neighborhoods. Like many cities, the Central Business District (CBD) has the largest, most luxurious hotels – with the highest prices, of course. Families with kids will probably prefer the moderately priced Southbank area, which offers easy access to attractions and kid-friendly activities, as well as shopping and dining. Those on extremely tight budgets would do well to look for accommodations in the City, West End and Spring Hill neighborhoods. Don’t overlook the chains: While boutique and luxury hotels certainly have a presence in Brisbane, chain hotels are also well represented in the city. The Hilton, Accor, Marriott Brisbane, and more familiar names have multiple locations throughout the city, and often offer specials and packages to save travelers money. If you travel often, consider joining a points program for your favorite chain to earn discounted or even free stays in almost any city. Look for package deals: In an effort to attract guests, especially in the off-season, many Brisbane hotels offer packages that include room discounts, meals, and even attraction tickets or spa services. For example, the Royal on the Park, a luxury hotel, offers weekend romance packages that include spa services, breakfast and champagne. Consider all of the inclusions: When comparing hotels, consider each hotel’s features and what’s included in the room. For example, CBD hotels may have a higher nightly rate, but the convenience of staying closer to the city might outweigh the cost. Likewise, if you’re on a budget, choosing a hotel that includes a breakfast buffet, free parking, or airport transportation might be worth spending a few extra dollars per night. Or consider a full-service resort like the Brisbane Holiday Village, which includes plenty of activities as part of the room rate. Look beyond the traditional hotel. While there are plenty of hotel rooms to be found in Brisbane, there are other options for accommodation that could save you a few dollars. In the Brisbane suburbs, multiple properties offer apartment accommodations, short-term rentals for a few days or a few weeks that give you more space for your money. If you’re traveling with a family, renting an apartment is a great option, as it usually offers several bedrooms, a full kitchen and in some cases, access to amenities like swimming pools or workout rooms. Staying in an apartment can save you some money beyond the room rate, as you can use the kitchen to make some of your meals each day. In terms of finding an affordable place to stay, Brisbane has perhaps more options than any other Australian city. Do your research right and find the option that works best for your budget and your needs while in the city. This article was written by Erica Gustafson who is a freelance media consultant and writer for Expedia. She enjoys traveling throughout Australia and writing about her experiences. Photo by Shaun Johnston on Flickr. Last updated by Erica Gustafson on 28 April, 2014 in Lodging.